Trim the tough ends off the asparagus. Cut in diagonal pieces, 1/2 inch thick. Save the asparagus tips for the topping. Heat butter in a large saucepan. Finely chop onion, garlic and potato and add to the the pan and sauté for about 5 minutes or until soft. Add the asparagus, stir around and let fry on low/medium heat for a minute, then add spinach, stock, white wine vinegar and season with salt and pepper. Meanwhile prepare the topping: Finely chop the asparagus tips and the parsley and place in a bowl together with the boiled lentils and the toasted pumpkin seeds. Add chili if your prefer it a little spicy. Pour over olive oil and stir around until it’s all mixed well. Carefully pour the soup into a blender or use a hand blender to mix until smooth. Taste the soup, add more water or salt and pepper if needed. 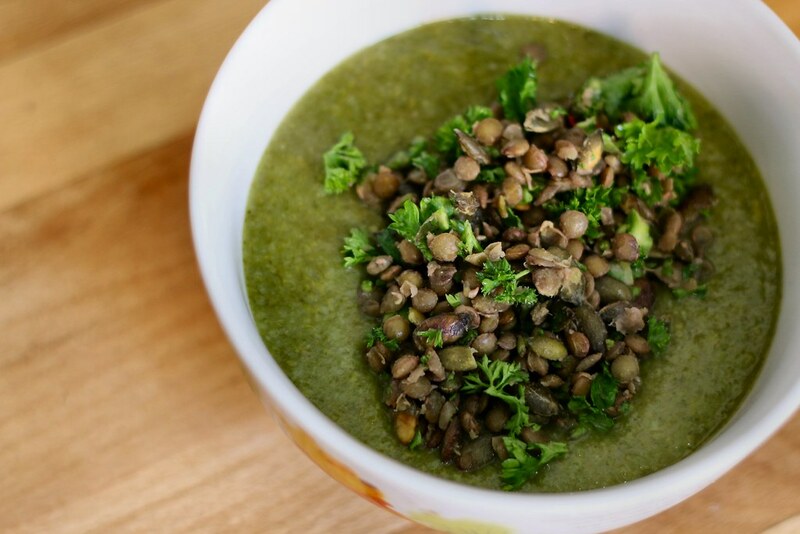 Serve the soup with a generous portion of the lentil mixture on top. Enjoy!